Six young people wrote independently to Exeter IVC and were put in touch to share transport from Plymouth sometime early in 1976, but it was soon suggested they start their own IVC. 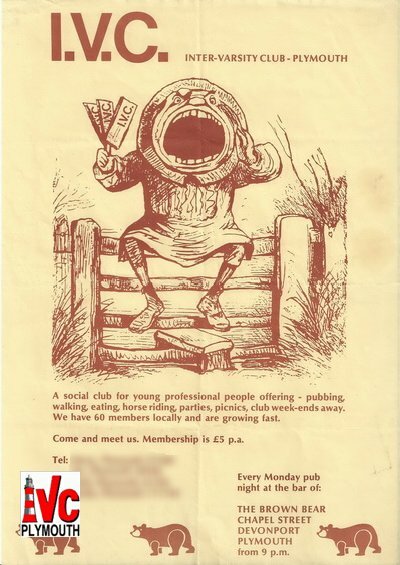 The club was at first entirely informal, having evenings out as a group of friends and meeting in each others` houses, an advertisement was put in the Herald and new members trickled in slowly (by January 1980 there were 33). Liz W lived opposite the RC cathedral and the “Bon Viveur” resident landlord Andy T got interested and “No. 24” soon became the focal point of the Club. Patrick M came to live there in August 76, and John S joined in soon after. The oldest, and probably the first printed programme which survives starts 26 January 1977, with bowling at Club Fiesta with Lyn S, and the first AGM was held at Hilary and Jane’s flat near the Hoe on the 9th of February 1977 when the first committee was elected, and Eammon McQ, a lecturer at Plymouth Polytechnic, became our first Chairman, and the annual subscription was fixed at £3.00! Eammon was a keen hiker and led energetic walks on Dartmoor and all around Plymouth. This enduring tradition of Sunday walks is a core activity of the club to the present day – starting with a Pub lunch at a more civilised time, thankfully. Various ” Firsts” quickly followed – the inaugural Christmas Dinner evening at Mother Hubbards (Yealmpton) on the 9th December 1977 where we nearly froze, and the infamous successor to Eammon who was elected Chairman at his first meeting but didn’t come again !! John S, another Poly lecturer, then took over for the next two years and the Club quickly became more organised. Joanne S, a pharmacist, introduced a new colleague, Kathy T, who married Andy T in May 1979, the first IVC wedding. Happily Bells have rung out a number of times since, and the Club soon became a sociable mixture of both singles and couples. In early May 1981, we hosted a very successful AIVC Bank Holiday weekend, when some 80 members of other Clubs from around the country descended on us and we all felt Plymouth IVC had “come of age” and was here to stay. Many and varied are the events recorded in the almost unbroken Programme Archive, a long and happy saga of sociable enjoyment by many friends, old and new. Long may it continue – come and join us ! How Plymouth IVC began – as recalled by Liz W and Patrick M who have been members from the start!